Happy February, readers! At Luxe, we get a lot of brides who are planning their nuptials somewhere warm, sunny and often right next to the crashing waves (excuse us while we day dream in jealousy from this chilly crisp Ohio day). Today we are going to talk about destination bridal gowns! However, you may be surprised at what we have to say. Often, brides have an idea that when you are getting married beach side, it is a must to wear a simple, flowing, chiffon gown. Although this look is absolutely stunning, we are here to open your eyes to a few other options that may surprise you! Now, on to my personal fav, dun dun dun dunnnn THE BALLGOWN! Ballgown shapes are often thought of as heavy, but this isn't always the case! Keep in mind, it isn't the shape of your dress that weighs it down, it's the fabric! 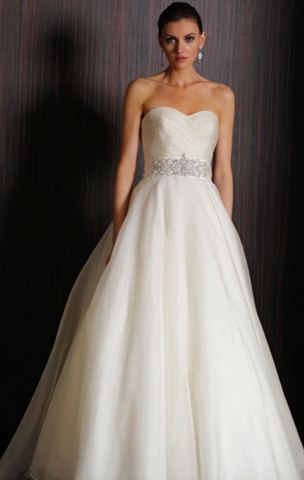 Sticking to fabric like organza or soft tulle will leave you feeling light, airy, and like a total princess! Of course, we have also got you covered if you are looking to sparkle even brighter than that beautiful blue water, which is exactly what this Martina Liana stunner is sure to do! Newer PostMORGAN'S MUST HAVES: THROW BACK THURSDAY!